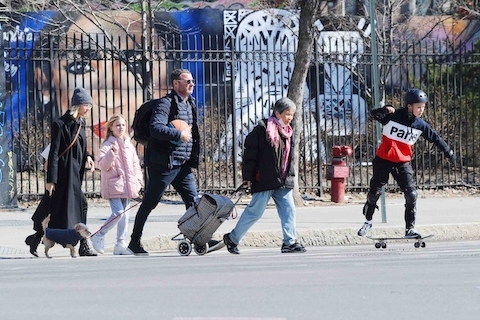 That woman with the luggage has NO idea that she’s walking past a celebrity crossing the street in Manhattan. Ray Donovan star Liev Schreiber, 51, took his sons, his girlfriend Taylor Neisen, 26, and his dog, to the park for some basketball and skateboarding. Last night on SNL, Pete Davidson acknowledged the 20 year age difference between him and girlfriend Kate Beckinsale, and he called out a long list of celebrities in the same situation, but he forgot to name Liev Schreiber!